This artist's rendering shows The Las Vegas High Roller, which at 550 feet will be the tallest observation wheel in the world. Caesars Entertainment Corp. has raised the stakes in Las Vegas. The company on Wednesday announced plans for The Linq, a $550 million retail, dining and entertainment project at the heart of the Strip. The highlight will be a giant Ferris-style observation wheel — The Las Vegas High Roller — which at 550 feet will be the tallest in the world. Or, in Las Vegas’ case, the icons du jour as The Las Vegas High Roller goes head-to-head with Skyvue Las Vegas, a competing project that broke ground in May on an 11-acre site across from Mandalay Bay at the southern end of the Strip. The brainchild of local developer Howard Bulloch, the project will include a 476-foot observation wheel, along with a roller coaster and 200,000 square feet of retail, restaurant and entertainment space. “We expect it to be up and running in time for New Year’s 2012,” Bulloch told msnbc.com. This artist's rendering provided by Compass Investments on May 23, 2011, shows plans for the Skyvue Las Vegas Super Wheel on the south end of the Las Vegas Strip. For his part, Bulloch says he isn’t worried about the competition's greater height and mid-Strip location. 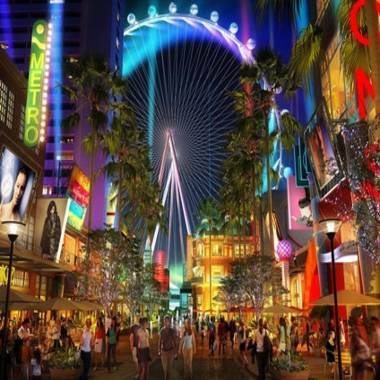 The Linq, meanwhile, will span more than 200,000 square feet directly facing Caesars Palace and also will bring upgrades to three Caesars Entertainment resorts: Harrah's Las Vegas, Imperial Palace Hotel & Casino and Flamingo Las Vegas. Construction is expected to begin at the end of this year, with an anticipated opening date in 2013. Regardless of the competing projects’ merits and comparative odds of success, both are up against a third foe: history. In the last 10 years, Las Vegas has seen proposals for at least three other observation wheels, all of which collapsed before they got anywhere close to rolling. Then again, this is Las Vegas, where bucking the odds is a way of life, which may explain why some independent observers feel an observation wheel could strengthen the city’s hand in the high-stakes game of attracting tourists. Doubling down on a second one, though, could be a bust. 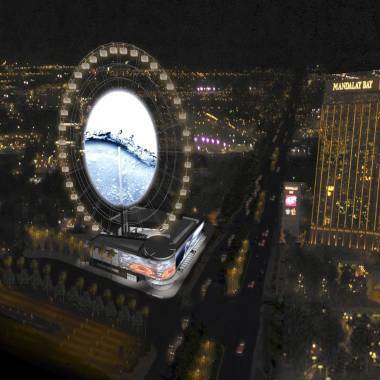 “Vegas has a lot of crazy ideas but I think an observation wheel would fit really well here,” said Anthony Curtis, president of LasVegasAdvisor.com. “Look at the Stratosphere. That observation tower still gets a lot of visitation and I think you’d see a lot of the same people getting on an observation wheel.